A couple of posts ago I was talking big about returning to regular posting, something I managed for all of about a week before everything fell in a hole again. I’m not going to make any more rash promises for the moment, simply because I’m still caught in the perfect storm of work and external commitments that has made blogging difficult since the end of last year. But I will try and make sure I do a bit better than I have in recent weeks. In the meantime, I’ve got a few things happening around the traps. 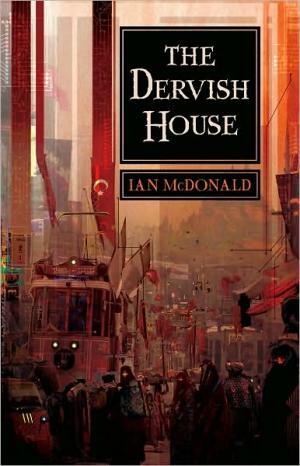 Over at The Spectator’s Book Blog I’ve got a long piece on Ian McDonald’s The Dervish House, which despite being passed over for the Arthur C. Clarke Award in favour of Lauren Beukes’ rather fab Zoo City won the BSFA Award for Best Novel last week and is shortlisted for the Hugo Award for Best Novel. As I say in the piece it’s a travesty a writer of McDonald’s talents isn’t better known outside SF circles, especially given how little separates his work from that of writers such as Richard Powers and David Mitchell, so if you don’t know him I really do recommend checking the book (and indeed the review) out. Elsewhere I’ve posted my review of Téa Obreht’s The Tiger’s Wife to the Writing page, something I promised to do weeks ago. Obreht is in Sydney for Sydney Writers’ Festival in a few weeks, and the book is both good and interesting, so take a moment to check it out if you get a chance. And finally if you’re in Sydney you’ve got two chances to hear me gasbagging on in the next couple of weeks (and then about a thousand once the Festival begins, but I’ll do a separate post about that soon). The first is on this week’s episode of TVS Channel 44’s Shelf Life, which features an interview with me about reviewing and writing online. I’ve not seen it, and the first screening was actually last night, but the show is on air three more times this week: today (Wednesday) at 1:30pm, Friday at 8:00am and Saturday at 12:30pm. If you don’t get Channel 44 or you’re outside Sydney you can stream the show from the TVS website. And if that’s not enough I’ll be appearing alongside P.M. Newton, Kirsten Tranter and Sophie Hamley as part of When Genres Attack at Shearer’s Bookshop in Leichhardt at 7:30pm on Friday 13 May, a session devoted to exploring what it is that fascinates each of us about genre television and fiction, and to asking some questions about how we think and talk about genre, and how that’s changing as the cultural landscape changes. And yes, I’ll be back later this week. At least I hope I will. I’ve been meaning to check out Ian McDonald ever since I read a short story of his in Jonathan Strahan’s anthology “The Starry Rift.” It was literally the only one that stood out as being excellent – and this is an anthology that included Neil Gaiman, Alastair Reynolds and Cory Doctorow. Also, urgh, the Spectator? Maybe the UK edition is okay, but the Australian version is more ludicrously right-wing than Quadrant. He’s pretty great – I really do recommend taking a look. And the UK Spectator is pretty right-wing but it’s a much more substantial publication than its Australian counterpart.